If 15-year-old Tanishq Abraham from California could become the youngest biomedical engineer in the United States, why not 12-year-old Naisha Bellam from Maryland could turn a humanitarian for underprivileged kids of her age? Naisha Bellam, a resident of Montgomery Country in Maryland is a Good Samaritan for school dropouts and needy school goers in rural India. A committed member of Chirag’s Youth Club in the US, Indian American Naisha Bellam has gone beyond her school textbooks to learn from realities in day-to-day life. She launched “Caring4Kidz” initiative as part of Chirag Nonprofit Organization headquartered in Fremont, teamed with several young volunteers across the US, raised funds over $20,000 and helped set up mini libraries for more than 10,000 students at 125 rural schools in different parts of India, including Telangana. 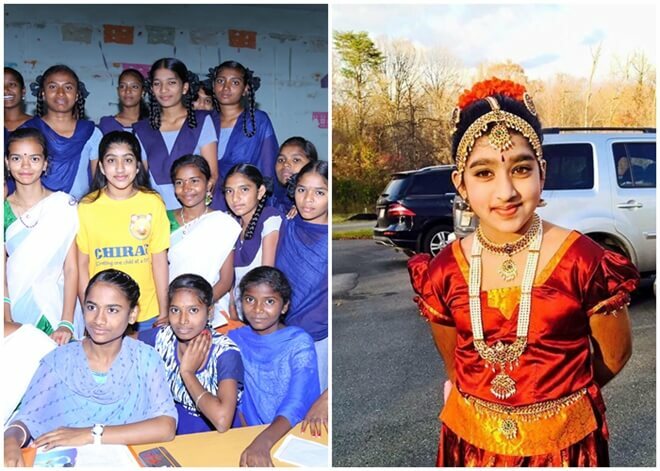 A 7th grader at Rocky Hill Middle School in Clarksburg, Chirag Youth Club’s Naisha Bellam belongs to Khammam, a suburb 120 miles away from Hyderabad in Telangana. Her trips to India from USA have been epiphanic realizations and life-changing experiences for her. The inspiring story of Naisha Bellam and her humanitarian work is part of ‘Young Indian‘ series at Travel Beats, a portal for overseas Indians in USA by Indian Eagle Travel. During her past trips to India, she encountered dire pictures of child labor in Khammam and nearby rural areas. She observed kids at the mercy of their employers, and the working kids’ poor living conditions appalled her. On a further probe into the hard-edged reality, she found that those kids were left to earn for themselves or supplement the family income at a very tender age. Most of them were school dropouts who ended up being child laborers due to lack of motivation, support and facilities. 50% of Indian children aged 6-18 do not go to school, and dropout rates increase alarmingly in class 3 to 5, according to her finds. Astonished by the poor literacy stats in rural India, Maryland-based Naisha Bellam contacted Chirag Youth Club and checked on how to support those children. The members of Chirag Youth Club, including Indian American teens responded to her. Naisha launched Caring4Kidz initiative for the welfare of school dropouts and underprivileged students in rural India, in collaboration with Chirag Nonprofit Organization. She recruited more volunteers for Chirag Youth Club and increased the member strength. She leveraged the collective power of social networking, YouTube videos and online communities to run awareness campaigns on the abject circumstances of children in rural India. She, along with her team successfully raised funds for the initiative. She also found to her utter surprise that most schools in the rural belt of India hardly provide quality education due to limited resources, such as lack of libraries and inadequate access to quality books. A place without a library is like a wilderness for growing children. Several research studies have revealed that libraries have a positive impact on reducing school dropouts and helping children take interest in education. Undeniably, reading is a good exercise. It improves imagination and helps develop other skills. “In summer 2018, my dad and I took flights to Hyderabad, stopped by some schools in our hometown to check how much they would benefit from the mini library project, and found the project a highly feasible one. That’s how we initiated the Chirag Mini Library project to help the students of 125 government / tribal schools in rural India with access to quality books on social studies, science, math, English and fiction,” said Naisha Bellam sanguinely. Naisha Bellam and her team of volunteers distributed around 200 books to each of the 125 rural schools and brought more than 10,000 students within the purview of mini libraries under the Caring4kidz initiative. “With the mini libraries being accessible to all, school dropouts can continue their passion for reading and learning. Personally, I have learned a lot from this experience and these kids have taught me to be optimistic and smiling in every phase of life. I wholeheartedly would like to thank the entire Chirag team, Chirag youth volunteers and PMR memorial trust (India) for their support, encouragement, and guidance,” Naisha shared with Travel Beats. A member of the US girl scouts, Naisha Bellam is an equally active philanthropist in Montgomery County. She earned the Girl Scout bronze in 2017 for having collected winter cloths and distributed to the needy people at Germantown Park and Ride. She worked more than 250 hours as part of the Student Service Volunteering in Montgomery County and earned “The 2018 Superintendent’s Student Servicing Learning Award”. She also raised funds for National Center for Children and Families and donated 50 backpacks.